Dull Knife was born in Montana, in 1810. As a young man he earned the respect of the people in his Northern Cheyenne tribe. Once, when winter fell early, his people were left with little food. With his tribe facing starvation Dull Knife led a hunting party through harsh terrain over 150 miles. Just in time, in the midst of a horrible storm, he and his men returned with enough dried buffalo meat for the entire tribe. Dull Knife's record in battle was also well known. Over and over he displayed his bravery. Once in battle his brother was severely wounded. Dull Knife, under a steady barrage of arrows and spears rescued his brother. He was wounded two times. 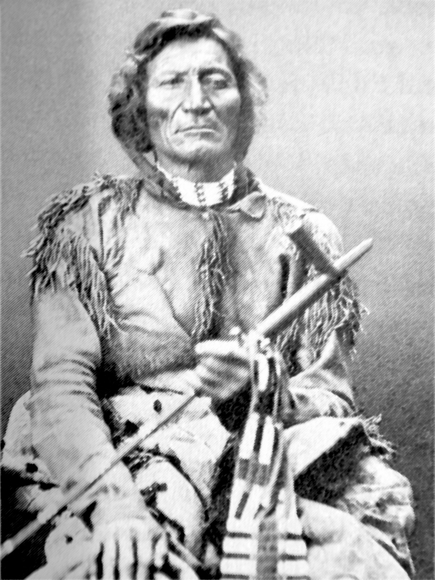 Dull Knife would represent his tribe during the first peace negotiations at Fort Laramie in 1868. Dull Knife was now chief of the Northern Cheyenne. However, things would quickly change when miners discovered gold in the Black Hills. Almost at once, settlers and miners began moving on to the most sacred of the Cheyenne hunting ground. Dull Knife and the Cheyenne saw these people as trespassers. At the same time, Custer and the Seventh Cavalry had massacred Southern Cheyennes at Sand Creek, Montana. Dull Knife, the Lakota, and other tribes decided to retaliate against Custer and the Seventh Cavalry. They would finally catch up with them at the Little Big Horn, Montana in 1876. Custer was vastly outnumbered when he and his 200 men fell victim to 2,000 war hungry warriors. Dull Knife and the other chief's excitement would be short. In less than a year he and the Cheyenne were being chased across the Great Plains. Eventually, Dull Knife led his people into the Bighorn Mountains to their homeland at the head of the Powder River. At the same time, General Ranald S. Mackenzie and his troops left Fort Fetterman in search of Crazy Horse and the Oglala people. In November, Mackenzie by chance encountered Dull Knife and 400 of his warriors. Mackenzie's troops annihilated Dull Knife and the Cheyenne. A small group of Cheyenne survivors managed to make it to Crazy Horse's encampment. In all, 11 children froze to death on the way. The survivors ate all of their horses. Finally, after a very hard winter with little food, Dull Knife and the other surviving Cheyenne surrendered at Fort Keough for reservation relocation. It didn't take long before the Cheyenne began feeling deceived. They had been promise rich hunting grounds that didn't exist. The little game that was once there had been killed by the early arrivals. Making things worse, the Cheyenne were dying of malaria. Often the food that was promised didn't arrive in time. Almost half of the Cheyenne died during the first year on the reservation. Then, in August of 1878, Dull Knife and 300 Cheyennes broke out and headed for their homelands on the Powder River. The very next day the U.S. Cavalry caught up with them, but the Cheyenne repelled the attack. Dull Knife and the Cheyennes would repel several more attacks before splitting up. After a few weeks they surrendered at Fort Robinson, Nebraska. The Cheyenne lived at the fort for two months before being ordered back to the same reservation. Then, on January 9, 1879 Dull Knife and a large group escaped again. This time they were led by Little Shield. Almost all of them fled by jumping out of the barracks windows. During the escape, soldiers shot and killed 70. Then another 31 died at Hat Creek Bluffs. However, Dull Knife, his wife, and son managed escape and stay gone for 18 days before they surrendered.